At some point in a person’s life, they realize that the world is out to get them. They realize that life is impossible, they can’t do anything right, nothing will ever go the way they want, and frankly, life is like burned bacon – BAD. You see, I had the opportunity to talk to someone special yesterday.This special person is a Mama, a Beautiful Mama who loves her little boy the way that I love mine. A Beautiful Mama who is in the process of making the most difficult decision of her life. The same decision that we made not so long ago. I didn’t realize, at first, that she was asking for help, support, comfort, and love. Instead, I thought she was judging me for something I said earlier in the day (that now, I realize she probably didn’t even see). I immediately became defensive about why we made the choice to place our beautiful son in a treatment center. I am not proud of the way I reacted, though I do think in another situation, what I said was very important. I think it is important for others to know what we are going through while our son is in a treatment center. It is not important to make us look like martyrs or saints. It is not important to make it sound like we are throwing a pity party (though I have had quite a few of those lately). It is important so that others know what families like ours are going through. It is important so that others understand that we are hurting, we are broken, and we are still madly in love with our children. I will tell you all what I said to the Beautiful Mama I talked to yesterday, another time. Today, I want to share with you the difference between my perspective and my reality. Yesterday, before talking to this Beautiful Mama, I was in the midst of a true pity party. I was feeling very sorry for myself. I have felt, lately, like Satan is just sitting around thinking of ways to attack my family. I have been trying to figure out just what on earth I can do to get him off my back, but couldn’t figure it out. Then, I had the opportunity to talk to the Beautiful Mama and realized I had it all wrong. It’s not what’s on earth, but what’s in Heaven. I was forgetting to depend on God for peace in my heart and life. This morning, I was reading email and saw that someone in an online support group I am in is fighting for her daughter, just like I am fighting for my son and the Beautiful Mama is fighting for hers. However, that person is fighting something else. When she placed her daughter, something horrifying happened. Something that no child should ever have to live through, but it did. After talking to the Beautiful Mama and then reading about this precious little girl going through something so deplorable, I realized my life isn’t really bad bacon. 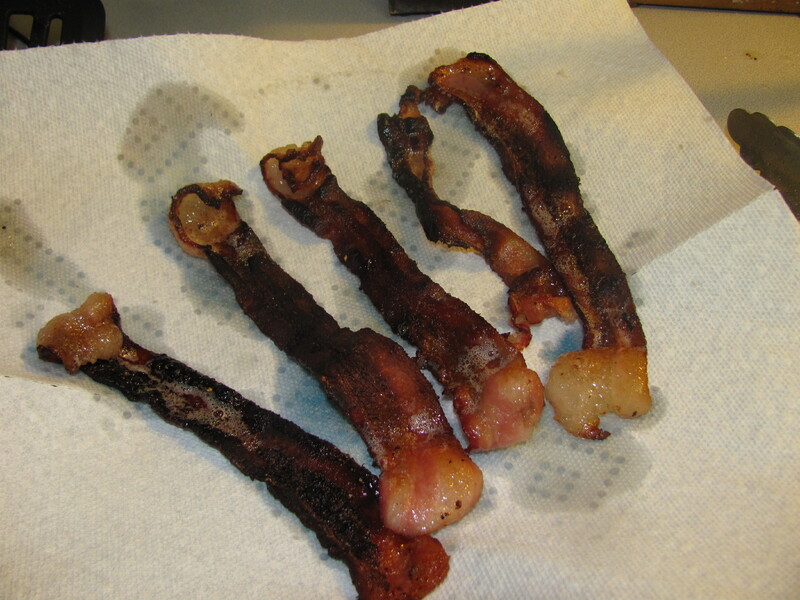 It may not necessarily be the crisp, thick cut, fresh from the hog bacon, but it is certainly not burned either. Talking to the Beautiful Mama yesterday blessed me beyond what I would have imagined. Having the opportunity to share my story with someone, to hopefully calm her fears, to be a shoulder, to be someone who truly understands what she is going through is a blessing to me. Going through this life is not easy, in fact it is indescribably difficult, but if my painful experience can help another family, then I pray that I am able to share and glorify God by doing so. While this life is exceptionally difficult in so many ways, to be able to help other families who are also going through this life is a blessing to me. It is not a life that I want anyone to ever experience, but reality is that they are. I hope that I am able to help them, even if it is only an understanding ear. I pray that God will continue to give me peace, continue to give me strength, and continue to give me wisdom. I pray that I will continue to have opportunities to glorify Him by sharing our story, even the difficult parts since they are reality. However, I pray that I am also able to keep a thankful heart through the reality, and that my perspective does not cloud the blessings that I have. Next Post Whose Line Is It Anyway? perspective is such a powerful thing isn't it? i love the story you shared – it will help me to remember that whenever i'm feeling sorry for myself, i ought to take that as a prompting to make an effort to connect with someone else in my life to see things from their perspective. not only will it get me out of the fog of my own circumstances, but it will be an opportunity to love ans serve someone else. Thanks so much, Heidi! 🙂 I'm glad it gave you something to think about. It's hard for me at times to keep life in perspective. Pity parties are often much easier to participate in.